Superlight 125 - Keeway Q.J. The Superlight 125s single-overhead-cam four-stroke single-cylinder engine is smooth and powerful enough to reach 90 kph. Oil-cooling makes it durable for the long-haul, too. The 125 is fitted with the same fatty tires as the Superlight 200, a 16-incher up front and 15-incher in back. 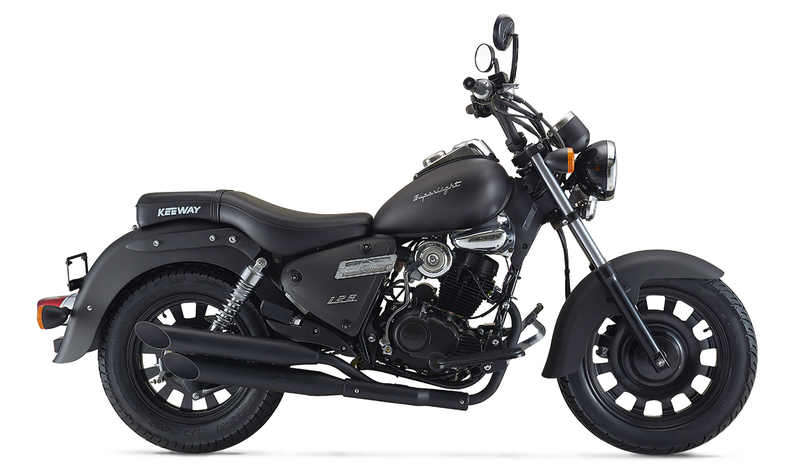 They’re mounted on custom-look blacked-out wheels that give the Superlight 125 a powerful, substantial look, and also offer superb traction. Custom-shaped fuel tank, fenders, instruments, headlight nacelle and saddle give the Superlight 125 a big-bike, classic custom look. There’s extra chrome on this one, too. The 125’s high-mount handlebar, scooped saddle and forward-set floorboards offer riders a comfortable, laid-back riding position, perfect for long or short treks.